events for our 2017 show will be announced soon! 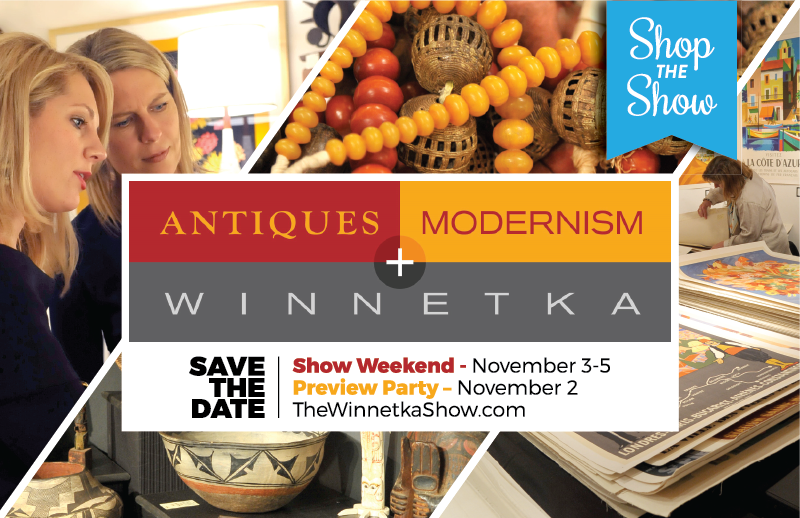 The Antiques + Modernism Winnetka Show (A+M Show) will be held on November 3 through 5 at the Winnetka Community House with a Preview Party on November 2. The show is the ultimate destination for interior designers, shoppers, and collectors alike. Ranging in styles from classic to modern, the Show is renowned for exquisite home furnishings and accessories, artwork, clothing, and jewelry. Proceeds from the Show benefit the Winnetka Community House, a unique, local non-profit that provides educational, cultural, social and recreational opportunities for people of all ages. In May, the Woman’s Board of the Winnetka Community House partnered with MAZE Home to kick-off the 2017 Antiques + Modernism Show [A+M]. Guests including Woman’s Board committee members, local residents, and MAZE Home customers enjoyed a variety of light bites and libations, while celebrating the launch of A+M and viewing MAZE Home’s beautiful collection of home décor and gifts. Click here to find out more about the kick-off! Find out about upcoming events as soon as they're announced!